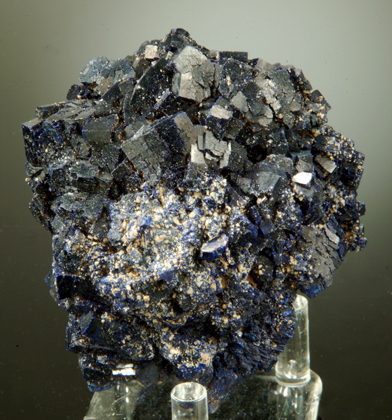 A very large and striking example of this find, this ball like cluster has distinct and sharp crystals of Azurite reaching 2 CM with deep blue color. This is less "rose like" than some other examples and more a spherical aggregate of blocky crystals. There is minimal damage (some very small bruises not immediately seen and not in the better display areas) but the overall impact is very strong. One of the very best we have seen from this mine. Shuikoushan Lead Zinc Mine, Changning, Hengyang Pref. 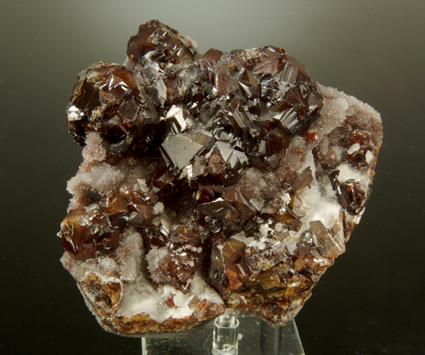 Large, lustrous crystals of undamaged Sphalerite perched on a contrasting quartz matrix. 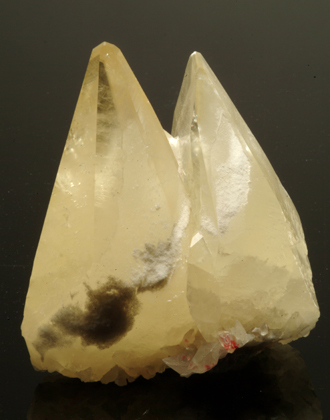 Individual crystals to 3.8 CM that are complex and intergrown with many distinct faces. The color is a dark red to brown-black and the smaller crystals are gemmy translucent while the larger ones are only on the edges. This is really worth far more than the price! 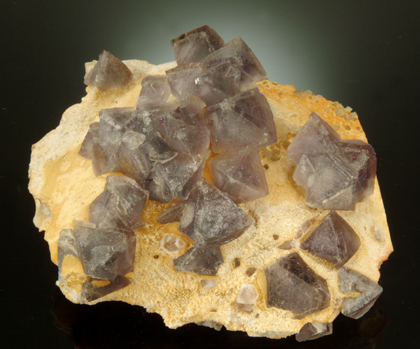 A very large cabinet plate of Quartz and Fluorite layers with the top covered with fluorite octahedra of purple to violet color. Very esthetic and different from the usual fluorites from this location. The quartz has been etched to expose the fluorite and the result is impressive. Crystals exceed 3.4CM and there is no damage. 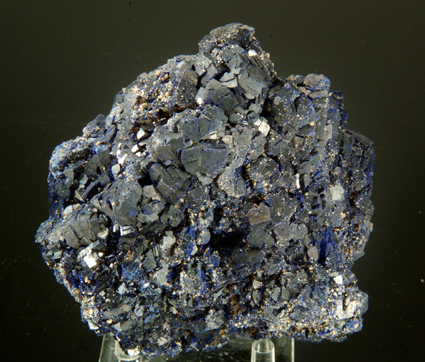 A very well developed almost spherical aggregate of blocky azurite crystals up to 1.4 CM and some smaller flattened rhomb forms. This piece is also encrusted with many lemon yellow micro crystals of an unknown mineral (awaiting analysis we will send results if you wish). Quite attractive and a good value. A matrix of reddish muscovite provides a good contrast to these Goshenite crystals. The largest is 3.8CM and is partly gemmy with a very sharp tabular form. This form is also different from the usual tabular beryl (aquamarines) from this location, and are far less common. Goshenite is one of the rarer types of beryl and these are very fine examples, not often available. The underside of the matrix is sawn which is common in collecting these, this one has a crack that seems to be a repair of the matrix, it is completely invisible on the display side. 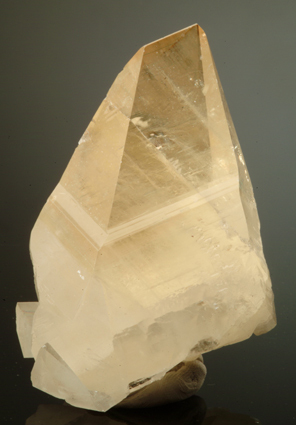 A single sharp, gemmy calcite crystal that has a light amber color and is in outstanding condition. Great form and luster, the clarity at the tip is very good. Shimen has produced some very fine calcites, among the world's best they are still a bargain compared with most other locations. 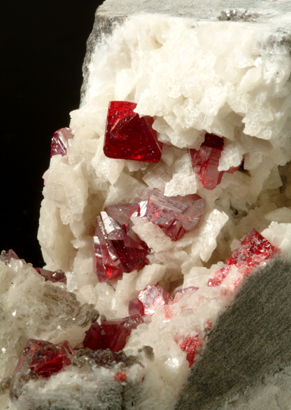 A sawn matrix block shows an open vug with several forms of cinnabar crystals, some are gemmy and very sharp reaching 1 cm. Some damage to crystals at the edge of the pocket but not excessive. This relatively dense coverage (there are about 10 crystals here) is not common and the best crystals here are very good indeed. A substantial cluster of fine calcites in very good condition and with great translucence and some transparency. 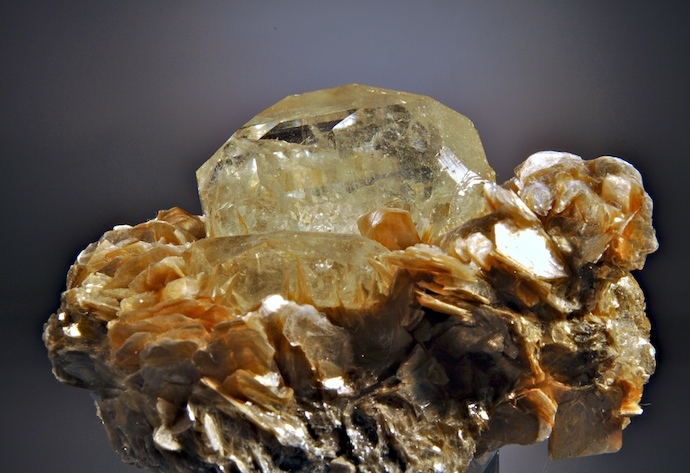 The largest crystal is 13 CM and the color is a light yellow to amber ranging to white. A good sized cabinet piece this has several possible display sides.